It is once again a curious moment in the Golden State, as the world's eighth largest economy lurches into a deeply unknown future. Carey McWilliams, one of the greatest writers about space and place we have ever produced, once said that California is to the United States as the United States is to the world. It was a comment surely rooted in typical Californian/American hubris, although McWilliams can surely not be accused of ignoring the ignoble sins of this would-be Zion, chronicled so painfully in Factories in the Fields, published four years before Steinbeck's legendary Grapes of Wrath fictionalized the same shameful period. But there is one thing I have always been proud of, even though it took me 32 years to take a dvantage of it - an unparalleled system of public higher education, put in place by a "master plan" in 1960 which would eventually result in a system that truly was world renowned, not to mention the world's largest. The three-tiered system, which includes 112 community colleges, 23 California State Universities and 10 UC's has an estimated 3.5 million students, almost 1 in 10 Californians. 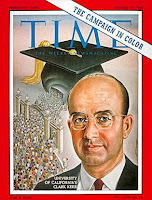 It is this legacy of the University of California that is at least as important as those moments of free speech that have gained so much fame over the years - a reason to remember Clark Kerr for something other than his decisions on those steps in 1964. 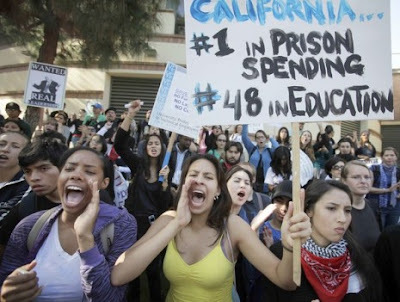 This past Thursday, the master plan and the Free Speech Movement came together - not simply on the campuses of the universities and community colleges, but in the very streets of the cities in which they are located. For the first time in my memory, students, teachers and parents took to the street to demand education - a return to the priorities of an earlier era, before neoliberalism and its constant fiscal panic meshed with a generation of bad decisions and reactionary populist referendums which threatened to undermine one of the greatest public works projects in history. This was not an on-campus protest, but one that united town and gown - students from Berkeley marched down Telegraph avenue into Oakland to rally with K-12 students and their families, many of whom see the doors to higher education closing in their face even as they seek to be the first generation in their family to walk through them. Protesters in San Francisco gathered 5,000 strong in front of City Hall, not on the SF State Campus, as the city came together to defend and demand education and the reconstruction of the California dream. It is a moment which must be appreciated from an urban perspective, for especially in Oakland, this was clearly not just about UC Berkeley, but about the potential futures of many low-income and minority youth, many of who still call cities like Oakland home. Any sense of a potentially better urban future hinges in part on a more educated one, both from the first days of reading up through the realization of personal and professional dreams at the university level. In a strange urban twist that seems like a blast from another era, one of the few rays of possibility lie in the upcoming 2010 election, where Jerry Brown - former governor, former mayor of Oakland, and scion of the legendary Governor Pat Brown - the producer of the 1960 Master Plan - is the presumptive democratic nominee and an early favorite to replace Arnold Schwarzenegger as governor. During his first run as governor from 1975-1983, he was certainly no friend to higher education, and many mark the beginning of the decline with his administration. He is the most unlikely of saviors - either for higher education, cities like Oakland, or both. If he does end up back in the governors office, on the first floor of the capitol building across from the eerie sculpture of the bear, let's hope he begins a new energy to the task - both California and Oakland surely need it. And a serendipitous remix in the spirit of my last post on the wonders of urbanism in Arizona. Credits: Image of Clark Kerr from uchistory.org. Image of protest from SDS of Chicago.